Scientific research has proved that even newborn babies respond to music, and that enjoying soothing sounds is one of our first primal instincts. 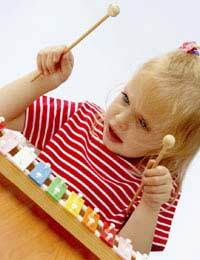 Babies love melody and rhythm, and toddlers also love to sing, pound on drums and make loud noises. So what better reasons do you need to take your baby or older toddler to a music class this summer? Finding the class that is right for you and your child can be tricky. Not only will it depend on your child's age, but it will also depend on you. Do you want something silly and fun, or something where the learning is a bit deeper? Usually, the success of the class depends on the music teacher. Some are funny and loud, others are sweet and soft - occasionally to the point of being sickly. It's up to you which approach you prefer. Many classes have dance and movement after the singing, so you may have to sample a few before you find the perfect fit. Many community centres which have playschemes for young children during the weeks also offer music classes during that time, sometimes at the end of the session. There also are numerous nationwide music franchises such as Gymboree, Monkey Music and Creative Wiz Kids which have programmes to suit a variety of ages. Ask around to see what's on offer. Most classes follow a similar format: children sing a variety of well-known nursery songs (Wheels on the Bus, Row Row Row Your Boat, Old MacDonald Had a Farm) along with a trained teacher, who often accompanies them on the guitar or some other instrument. Once the singing is over – about half-way into the class – a variety of musical instruments is brought out, including drums, maracas, xylophones, triangles etc. Kids bang on these instruments for a while to more music, then are invited to play more loosely, either dancing to songs, with a parachute, alongside dollies etc. Quiet songs are played at the end to signal that the class is over. Some classes are a bit different, concentrating on more non-traditional songs, incorporating more dance, helping the children to learn more about rhythm etc. If you want something a bit more unorthodox, you may have to dig a bit deeper – or start your own class! Try to ensure that your youngster is well-rested and well-fed before arriving at the class. It's no use attending a class with a sleeping baby or a starving toddler. Find a time slot that fits in well with your schedule - as well as your child's. It's no good attending a class during his or her regular nap-time. Look around to find something convenient for both of you. Invite a friend along. Although you will no doubt meet other parents, it's nice to have someone close who has a baby or child the same age as yours along for the ride. Don't be embarrassed by your child. Many parents feel uncomfortable if their youngster cries out during a class, dances uninhibitedly or refuses to participate. Follow your child's lead and let them do what they want. After all, the class is for them! Plan a little something afterward. Even a coffee (for you) and a biscuit (for baby) with another parent can make the class more of an event to look forward to than just a quick 45-minute session. Music is the stimulus which babies and toddlers respond to most, after the human voice, of course. While attending a baby music class probably won't turn your budding genius into an international composer or award-winning violinist overnight, your children will enjoy it and hopefully so will you.